thanks to michel from the kadao ton kao blog for today's great tape! the sikh people of thailand are a statistically small but visible minority with a historic presence in the country. from their most impressive gurudwara in bangkok's phahurat neighbourhood to smaller temples throughout the country, the group is represented in most major urban centers. 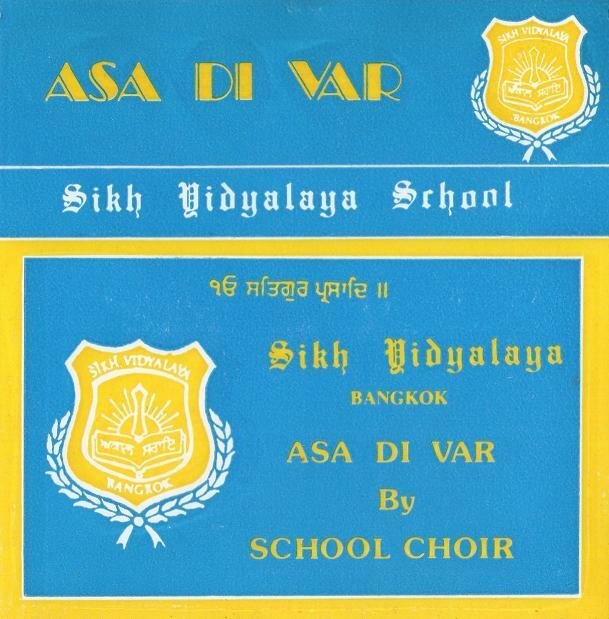 apparently, a tradition of parents sending their children to boarding schools in india has kept the student body at thai-indian schools small, but nonetheless the sikh vidyalaya has been around for decades. this cassette features children singing kirtan, the responsory praise music of sikh devotional ceremonies. the choir here is reciting the "asa di var", a collection of stanzas from the guru granth sahib. enjoy! Thanks for this real gem! wow this is great, i'll have to try it myself soon. i also got the "part 2" of this tape somewhere in a bag.